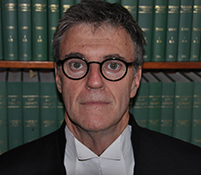 Ian Molloy is an Australian barrister who specialises in Papua New Guinea law. Over the last thirty years he has appeared in many PNG National and Supreme Court cases. He is regularly instructed by PNG, Australian and international law firms to advise on a wide range of PNG matters. Mr Molloy has given expert evidence on Papua New Guinea law in cases in Australia and elsewhere. He is regularly engaged for arbitrations and mediations of Papua New Guinea disputes. He also appears in the High Court and Court of Appeal of Solomon Islands.